Shipping Cost Free Freight Dock/Tailgate Delivery! OFM Mesa 66360 metal teacher's desk offers an HPL laminate surface. Two locking box / file pedestals and center drawer provide ample storage. 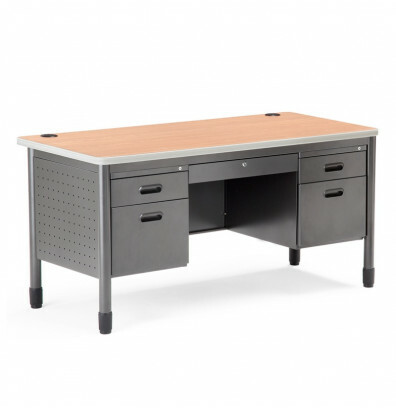 Dimensions: 27.75" D x 59.25" W x 29" H.
OFM Mesa 60" teacher's desk features a 1.25" thick high pressure laminate (HPL) desktop for long-lasting appeal. Features two three-quarter size box / file pedestals and center drawer for storing office supplies and letter / legal files. The pedestals and center drawer include locks for added security. Cable management grommets organize messy wires. Modesty panel ensures seated privacy. Durable steel base with scratch resistant powder-coat finish. The sturdy legs include leveling glides that adjust to uneven flooring. Ships ready to assemble. This OFM teacher's desk is available in cherry, maple, and oak laminate finishes. Ships ready to assemble. Product requires assembly. Click here for PDF instructions.